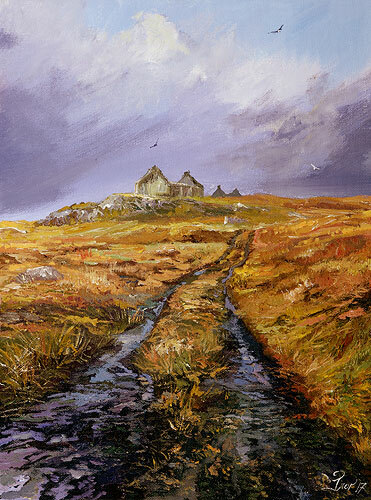 Passing this spot on the Pentland Road in Lewis on the way to Achmore, this peat road track was almost stream-like awash after heavy rain. The bleakness of this November day inspired me. The two abandoned sheilings at the summit of the hill lie battered by decades of elements. They are abandoned now but once hosted cosy peat fires and shepherds looking after sheep and cattle. If stones could talk what tales they would tell. The sky is heavy and rain-laden.